Funded by the European Research Council (ERC), Poppy is a 3D printed open source humanoid designed by the Inria’s Flowers lab, a French research facility that creates computer and robotic models as tools for understanding developmental processes in humans. Inria Research Director Pierre-Yves Oudeyer (who developed Poppy as a tool for studying the science of learning and development) hopes that the open source and 3D printable aspects of the project will enable researchers to quickly print custom body parts and experiment with different robot morphologies in order to study their impact on behaviour and learning. Our hypothesis is that the body is an essential variable in the acquisition of motor and social skills in humans. To study this theory, we needed to create a platform allowing fast experimentation of new robot morphologies. Oudeyer explains how open-source robots can help us better understand how humans learn and acquire language in his recent TEDxCannes talk. 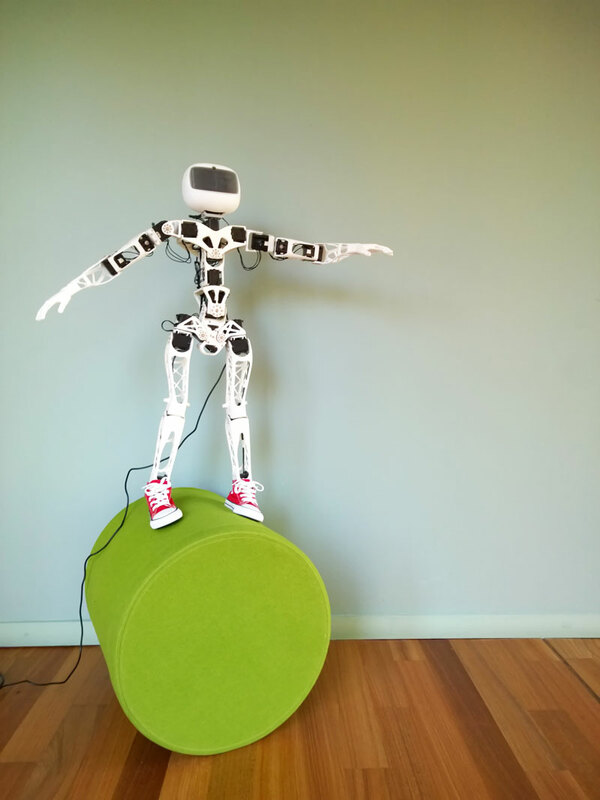 Arduino-compatible, Poppy can be assembled in about seven hours, and can interface with other electronic devices, including smart clothing, lights, sensors and musical instruments, making it an affordable humanoid platform for research, experimentation and education. Poppy with bent thighs. Source: . Poppy with straight thighs. Source: www.poppy-project.org. Giulio Sandini, who is Director of Research at the Italian Institute of Technology and leads the iCub project there, points out that while other humanoid projects such as iCub are also open source, the 3D-printable aspect of Poppy is significant because it enables researchers to study “the combination of bodyware and mindware, not only on the programmable aspects [of the system] but also on the physical ones.” In the thigh shape research, for example, “the shape of the thighs was investigated to understand if there is an optimal combination of ‘control’ and ‘shape’, [but] before 3D printing one could only study the ‘control’ because changing the ‘shape’ required a machine shop. 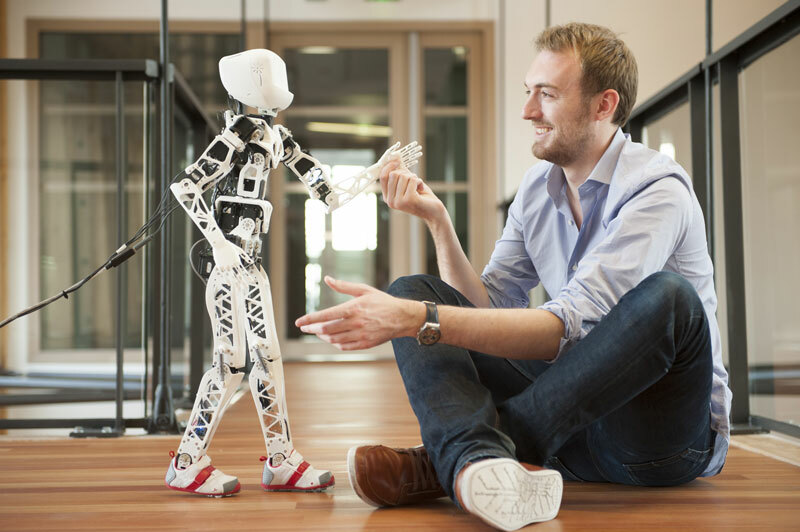 With 3D printing, changing the body shape is easier.” Another platform that is similar to Poppy in that it is both open source and 3D printed is Jimmy the Robot. The advances offered by 3D printing have already revolutionised design and industry. However, only very little has been done to explore the benefits of 3D printing and its interaction with computer science in classrooms. With our Poppy platform, we are now offering schools and teachers an adequate tool to cultivate the creativity of students studying in fields such as mechanics, computer sciences, electronics and 3D printing. Both hardware and software are open source. There is not one single Poppy humanoid robot but as many as there are users. This makes it very attractive as it has grown from a purely technological tool to a real social platform. Development team: M. Lapeyre, P. Rouanet, S. Nguyen, S. Ribas, J. Grizou, A. Le Fahler, F. Depraetre, C. Moulin-Frier, P-Y. Oudeyer.